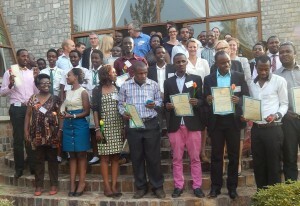 In the week of 13-17 July, a 5 days’ business workshop on Water and ICT challenges for young professionals in Rwanda was facilitated by Delft University of Technology (through the VPdelta programme and Delft Global Initiative), VIA Water and IBM Research Africa. During the workshop, fourteen young professionals were challenged to work on business cases that address urgent problems in the field of water storage, warning for (extreme) weather, water quality, water availability or Remote Sensing (RS) and Geographic Information Systems (GIS). The participants were trained by a team of experts (one of them being TAHMO initiator Nick van de Giesen) on topics such as water management, use of technology, entrepreneurship, business case development, market mapping, prototyping and proposal writing. But above all participants were encouraged to work within those five days, in a pressure cooking session, on their own cases. By using this approach the participants were stimulated to understand, design and implement their (new) sustainable business case on Water and ICT in Rwanda. The first four days of the workshop took place at the Gashora Girls Academy of Science and Technology in Gashora. On the final day, the participants pitched their business case in front of an expert jury at the Dutch Ambassador’s residence in Kigali. The winning team pitched a ‘Severe Weather Warning for Musanze City’ to provide timely and reliable predictions of lightning and floods through a Geoportal and App. They won a prize of 2,000 USD wherewith they are expected to develop their business ideas further into a full proposal for the VIA Water fund, a Dutch Programme which supports innovative water solutions in Africa. The runner-up team ‘Indogobe Smart Water Ltd.’, proposed to provide water storage and delivery services in urban Rwanda by means of intelligent water tanks together with an ordering app. 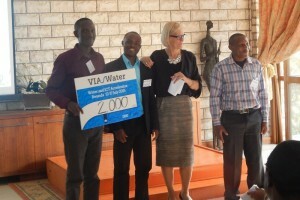 They were offered a prize of 1,000 USD or an entry ticket to the six weeks innovation challenge offered by VIA Water.